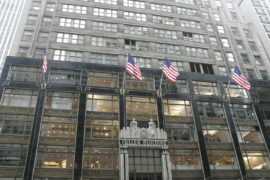 Straight after the Empire State, I had a full on day visiting 1930s skyscrapers in downtown Manhattan. Next up was the New Yorker Hotel, which fitted as did many in this wedding cake tiered style of design, with larger building space at the bottom, getting narrower and narrower as the building reaches upwards. 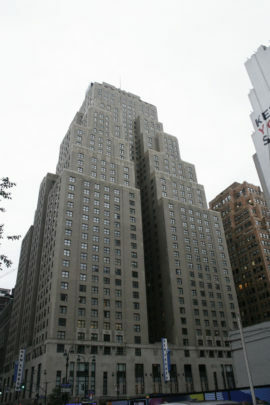 The 43 storey New Yorker Hotel was designed in 1929 by Morris Henry Sugarman, opening in 1930. The Hotel has some exquisite outdoor details, as are the elevator doors in the lobby and the elevator entrance, and some, again tiered light fittings. 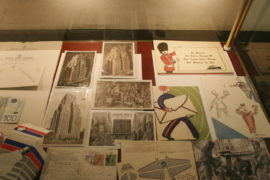 There was a really interesting exhibition on the lower floor with ephemera such as invitations, menus, photographs and promotional material from the hotel over the years which was really useful for me to see the hotel in its peak years. 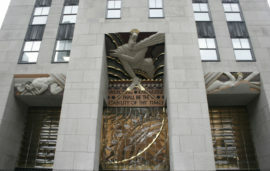 Nearby, I visited the Rockefeller Center, which is an incredible, spectacular complex of buildings with extravagant foyers, interiors and relief facades with art deco details in colours. There were originally 14 ‘art deco’ office buildings built in the 1930s, and further buildings were constructed in the 1960s and 1970s. The original buildings sit around a sunken square, where they have the ice rink in the winter, and a very large Christmas tree (it was a pumpkin display when I was there!). There is also a very impressive underground pedestrian area and shopping area. 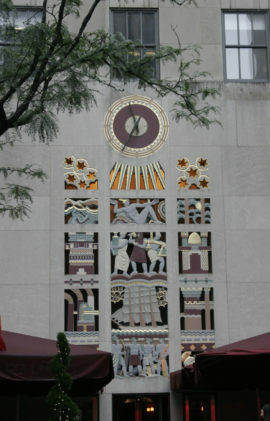 The most impactful façade relief is 30 Rockefeller Plaza, which shows the Christian biblical verse from Isaiah 33:6, ‘Wisdom and Knowledge shall be the stability of they times’, that has the relief mural of the man striking lighting. The man represents Wisdom, which is also the works title, and was created by Lee Lawrie, a well known architectural sculptor in the US. Wisdom is considered to be the creative power of the universe over humankind. There are two works by Lawrie on either side of this; Sound and Light. All around the original complex are elaborate façade details on doorways, exits and entrance. The building complex was commissioned by John D Rockefeller Jnr, and he commissioned architectural groups Corbett, Harrison & MacMurray; Hood, Godley & Fouilhoux; and Reinhard & Hofmeister, to design the buildings. 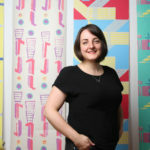 Unusually, the architects all worked as ‘associated architects’ so none of the buildings can be attributed to one architect, however I wonder if you research further into the history of the design this could be identified more. It is a very complex ‘symposium’ of buildings with multi-layered history of design and intention, and it is an area I would like to return to, to research about more which would take a bit more time than available on this trip. 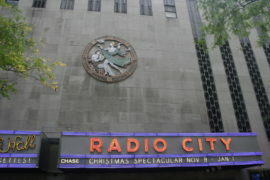 Also within the Rockefeller complex, the Radio City Music Hall also has taken the elaborate detailed facades of 1930s buildings for decoration. After visiting, I have seen images of the stage of the building and it looks incredible. 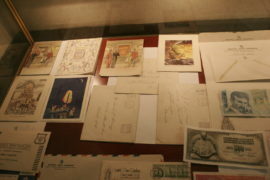 The tours were unavailable on the day I viewed the exterior and foyer, but again I would love to return and spend more time there. I also took a look at the Fuller Building, designed in 1929, by Walker and Gillette and unusually, brick and terracotta Chanin Building, designed by Sloan and Robertson. 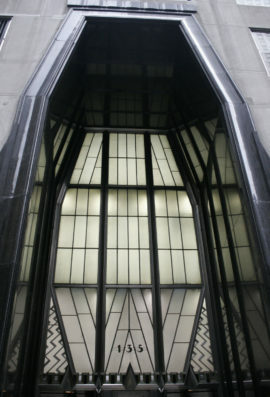 I was most excited to visit the Chrysler Building, as I had never visited its interior before, which is incredible. 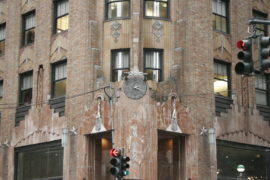 Similar to the Empire State Building, the interior is incredibly elaborate with expensive materials. 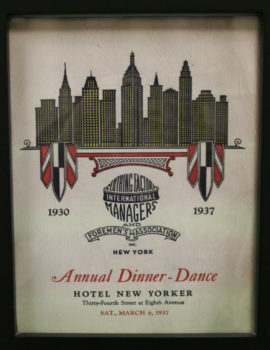 Designed in by architect William Van Alen for the Chrysler Corporation in 1930. The triangular shaped lobby is quite something. The walls are lined with African Red Granite, and unusual lighting and fittings are dotted around the intimate, atmospheric foyer. 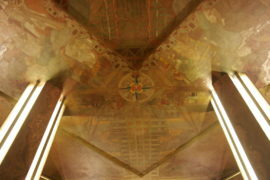 A ceiling mural, titled Transport and Human Endeavour by Edward Turnbull, is painted in the shape of a Y and celebrates the aviation and the machine age. 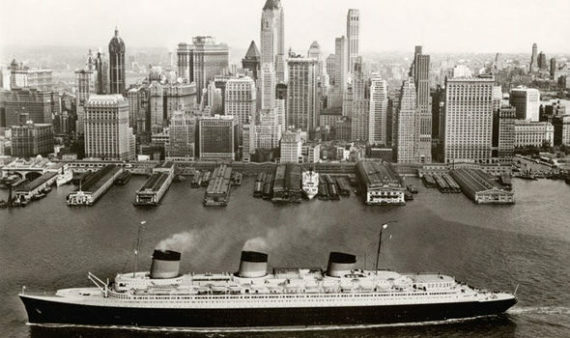 Nearby is the Waldorf Astoria, which I had looked at many photographs online before and was designed by Schultze and Weaver in 1929. Unfortunately, the building is very much in a shell type state at the moment as it is currently undergoing refurbishment. I didn’t know this in advance, but it was also interesting to see what windows that have been unwashed on a building in New York look like for a year or so – very dirty! There was so much to take in this day. It was exhausting but exhilarating and I’d now like to spend some time reading more about all of the buildings I have seen in person.